Aleen MacRae blames the lure of the sea for breaking apart her family and then her engagement. When her interest is caught by a man she sees both in person and in a dream, she resists—afraid to believe in her aunt’s prediction that her future is tied to the sea. Braden Williams is on the hunt for treasure buried centuries earlier by Rhode Island pirates. His search brings him to the property where Aleen lives. Collaboration on genealogy research draws them closer, and Braden steers her toward his true passion—sailing. Aleen MacRae is definitely a land lover, she blames the lure of the sea for breaking apart her family and the ending of her engagement. When Aleen’s aunt predicts that Aleen’s future will be tied to the sea she definitely does not believe her as Aleen wouldn’t be caught anywhere near. But when Aleen meets a mysterious man that has shown up in not only her dreams but now in her life she just may be turned into a believer. 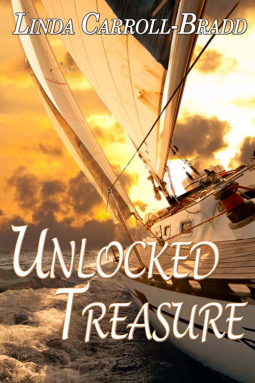 Unlocked Treasure was a really quick little novella at only 54 pages. At such a fast pace it had it’s sexier moments, it’s drama moments and the relationship taking place but as with something this short I always find a bit of depth missing to really become overly invested. Aleen and Braden were an ok couple and the story interesting enough though that if you are a fan of a steamier romance then this might be for you.